Monisha Narang Kattenborn was born in Dehradun, moved to Austria, studied law and in 2000 joined the Sauber Group as head of the Legal Department. In 2010, she was appointed the CEO of Sauber Motor Sport. She is the only woman to be heading an F1 team. A singular distinction. A young, good looking and vivacious lady, she is bubbling with energy and completely in control of everything around her. 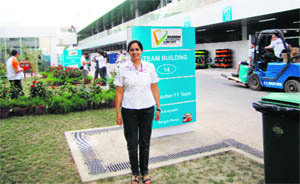 She was thrilled to be in India, the country of her birth for the recent first Indian Grand Prix. It was a great moment for her. Is cheese better than butter for heart health? Doctors and nutritionists have long recommended avoiding all animal fats to trim cholesterol, but Danish researchers say cheese may not be so bad, and probably shouldn't be placed in the same category as butter. According to their study, published in the American Journal of Clinical Nutrition, people who ate daily servings of cheese for six-week intervals had lower LDL cholesterol, the so-called "bad" cholesterol, than when they ate a comparable amount of butter. Venus Williams has revealed that she believes a diet of raw vegetables will blast her back to the top of women’s tennis. The 31-year-old five-time Wimbledon champ was recently dropped out of the U.S Open minutes before she was due to go on court due to an autoimmune disease. Any motor sport team is always on the lookout for a sponsor. Maybe, it was coincidence or destiny, as Indians do believe in these things to be having an influence on life. It so happened that Amul, the “utterly butterly” giant, was also looking for ways to get global recognition. Amul is already exporting its well-known products and here was an opportunity to reach out to about 500 million people. That is the number of television viewers for an F-1 race. R.S. Sodhi, managing director of the Gujarat Co-operative Milk Marketing Federation Ltd, or Amul as we know it, was happy and beaming as he saw "Amul" in its distinctive font written across the rear wing of the Sauber Ferrari. Said Sodhi, "Something like this was waiting to happen at Amul. We have a lot in common with F1. We collect 10 million litres of milk from 3 million farmers twice a day. This requires synchronisation of speed, precision and technology and where there is technology, there has to be innovation. 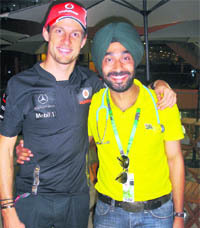 Amul is the largest known brand in India, with Sauber it will be a global name". 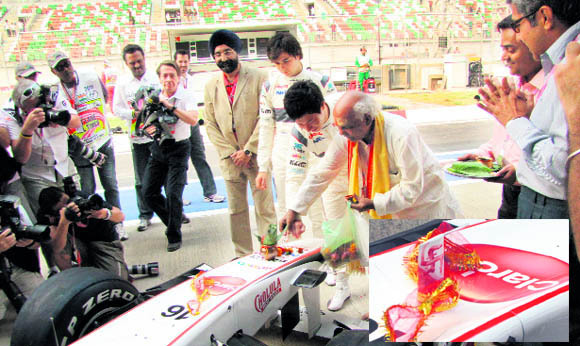 The first Indian Airtel Formula One Grand Prix on the hallowed soil o f Bharat! If you believe in these things, every one's stars were in the right position, the timing was right, the place was right, the people were right. To make sure the stars showered their benevolence on all concerned, a panditji was called in. It was an ancient ritual that the panditji performed in the Sauber garages that morning. Another first for any F1 team ever. It began with the panditji showering red rose petals on the sleek and gleaming Ferrari 056 parked outside the Sauber garages. The car was the centre of attraction for the dozens of photographers and media. Prayers were recited. The panditji applied tilak on the nose cone of the Ferrari, in the absence of a forehead. Panditji then tied a mauli to the fin on the car and drew a swastik on the fin, much to the horror of the foreign journalists! More prayers and panditji then wrote a mantra on the nose cone of the Ferrari. 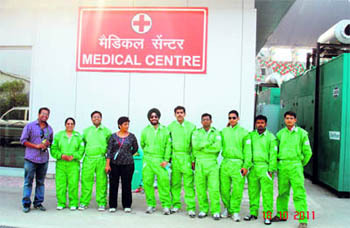 Still more prayers and panditji applied tilak on Kamui Kobayashi's and Sergio Perez's foreheads. The two drivers stood silently and stoically enduring the performance. This was India, a land of mystery, myth, spirituality and strange rituals. This was one such occasion. Everyone knows this, but few understand it. Amazement, amusement and questions were thick in the air. A group of foreign journalist/photographers approached me for an explanation, I was the only Indian journalist in the gaggle of camera-toting curious foreign media. "When your ancestors went out to do battle, they invoked the gods for their protection and victory. This is what the panditji has done!" I explained. Simple. Doctors and nutritionists have long recommended avoiding all animal fats to trim cholesterol, but Danish researchers say cheese may not be so bad, and probably shouldn't be placed in the same category as butter. According to their study, published in the American Journal of Clinical Nutrition, people who ate daily servings of cheese for six-week intervals had lower LDL cholesterol, the so-called "bad" cholesterol, than when they ate a comparable amount of butter. The cheese eaters also did not have higher LDL during the experiment than when they ate a normal diet. 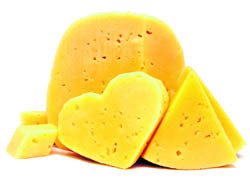 "Cheese lowers LDL cholesterol when compared with butter intake of equal fat content and does not increase LDL cholesterol compared with a habitual diet," wrote Julie Hjerpsted and her colleagues, from the University of Copenhagen. The group surveyed about 50 people. Each person was put on a controlled diet and added a measured amount of cheese or butter daily. Throughout, each participant was compared against his or herself, to follow changes in the body caused by the foods. Researchers gave each person cheese or butter, both made from cows milk, equal to 13 per cent of their daily energy consumption from fat. During six-week intervals, each person ate the set amount of cheese or butter, separated by a 14-day cleansing period after which they returned to their normal diet. Then they switched, and for six weeks those who had eaten the cheese before, ate butter, while the butter eaters in the first phase ate cheese. Despite eating more fat than had been in their normal diet, the cheese eaters showed no increase in LDL or total cholesterol. While eating butter, however, the same subjects had LDL levels about seven percent higher on average. While eating cheese, subjects' HDL or "good" cholesterol dropped slightly compared with when they ate butter, but not compared with their normal eating period. The researchers speculated that there could be several reasons why cheese affected people differently than butter. But there is nothing conclusive in the study. For one, cheese has a lot of calcium, which has been shown to increase the amount of fat excreted by the digestive tract.